consecration of the first female bishop. 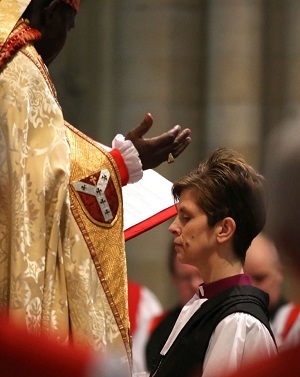 "I don't think you can overstate the fact that the Church of England allowing women to take up the role of bishop is going to change the Church. I think it's going to change our society as well because it's one more step in accepting that women are really and truly equal in spiritual authority, as well as in leadership in society." "It's been a really long journey but we were so pleased with the graciousness of the Synod debate." Since the Church of England is, literally, the official church of the country, it was necessary to pass a bill through Parliament authorizing the end to sexual discrimination in the Church. A bill was successfully approved by the Ecclesiastical Committee of Parliament, the House of Commons, and the House of Lords. It was given Royal Assent by the Queen on 2014-OCT-23. The matter was then returned to the Church of England Synod for a final vote. "When you have half the human race not eligible even for consideration, at the point at which they do become eligible there are manifestly people who might well have been considered in the past. So there is a whole system and that does include women in relation to archdeacons and deans but up to now bishops haven't been able to say 'This particular female priest would be very suitable as a bishop'. The Archbishop of York, Dr John Sentamu, chaired the meeting of the Church of England General Synod. On the first day of the two-day meeting, he called for the Synod delegates to vote by a show of hands. The measure easily passed. Twenty-two years had passed since the Synod decided that women could be ordained as priests. That change had caused hundreds of priests to leave the Church and join the Roman Catholic Church. More priests will probably leave as a result of this change. "Today we can begin to embrace a new way of being the church and moving forward together. We will also continue to seek the flourishing of the church of those who disagree." "People were surprised at how quickly women were accepted as priests. "... will be a slow process. ... The fact it is on its way is very exciting and good news for the Church and our mission to the world." Rev. Lane. 49, will be consecrated as the first female bishop. She will lead the diocese of Stockport in Greater Manchester, England. This is unexpected and very exciting. 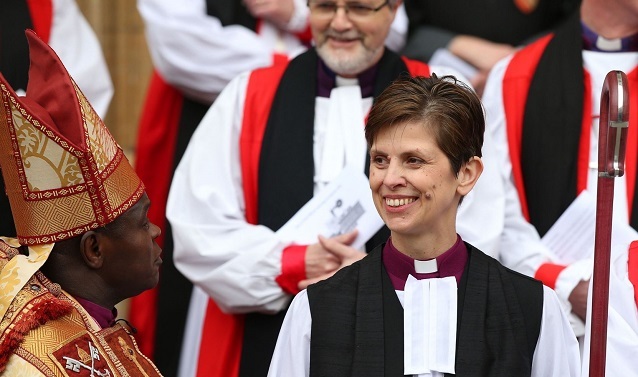 ... On this historic day as the Church of England announces the first woman nominated to be Bishop, I am very conscious of all those who have gone before me, women and men, who for decades have looked forward to this moment. But most of all I am thankful to God. "The Established Church is now the last great institution of public life in Britain to open its upper reaches to people of both sexes." Ths is a major advance in gender equality for Enland, particularly because the Church of England is the state church. However, this still leaves the Roman Catholic Church and many Christian fundamentalist and other evangelical faith groups as well as other religions who still discriminate against women achieving positions of authority. "It is high time we had women bishops. I have been praying and working for this day. In a few years' time when more and more women will be bishops, I predict we shall be wondering how we ever managed without them." Dr. Sentamu ignored the request. Instead, he responded with a prepared statement, and then asked the congregation the same question a second time. This time, were no dissenters, and the ritual continued.